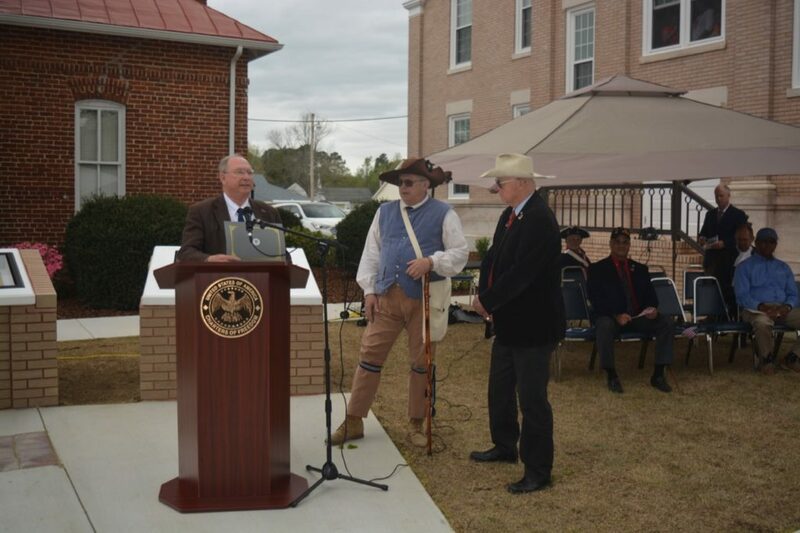 An historic event occurred in Halifax, NC on April 12th following the SAR’s 243rd Anniversary of the Halifax Resolves. 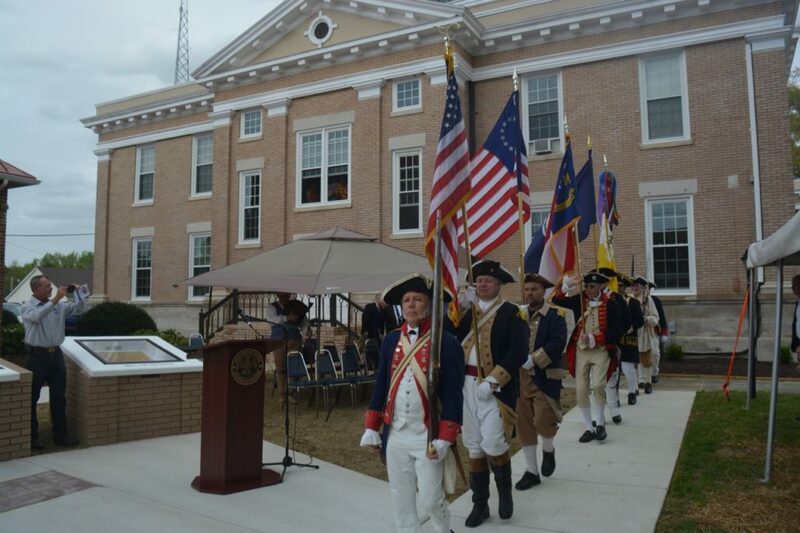 The Halifax Resolves Chapter hosted the NC SAR Color Guard to assist in the dedication of the Charters of Freedom display at the Historic Halifax Courthouse. The display contained a copy of the Halifax Resolves, the Declaration of Independence, the Constitution and the Bill of Rights. 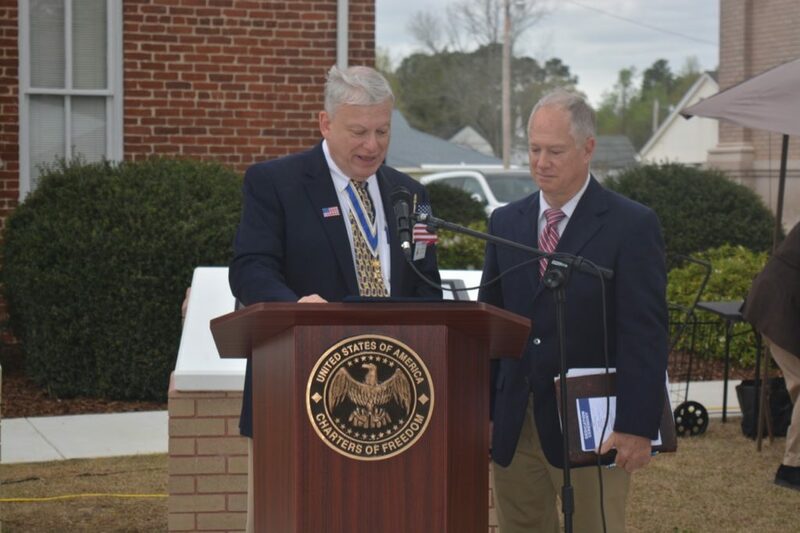 The display, with the exception of the Halifax Resolves display, was gifted to the county by Mr. Vance Patterson & wife Mary Jo who head Foundation Forward, Inc, a 501 (c) ( 3) organization based in Valdese, NC. The Halifax Resolves display was funded by contributions from the public. The purpose of the foundation is to educate the public about the Founding Documents of our great nation. The Halifax display is the first display to contain the Halifax Resolves. Mr. David Streater of Foundation Forward, Inc. presented Compatriots Ken Wilson and J. Rives Manning with Certificates of Appreciation for their efforts in raising the funds for the Halifax Resolves and overseeing the construction of the display. Halifax Resolves Chapter President Mr. David B. Gammon presented Mr & Mrs. Patterson with SAR Certificates of Commendation for their efforts in educating the public about the Founding Documents. The SAR participated in the dedication with the color guard presenting the colors, Halifax Resolves Chapter Compatriot Mr. J. Rives Manning, Vice Chairman of the Halifax County Board of Commissions, performed the duties of Master of Ceremonies and Compatriot Ken Wilson was the keynote speaker. 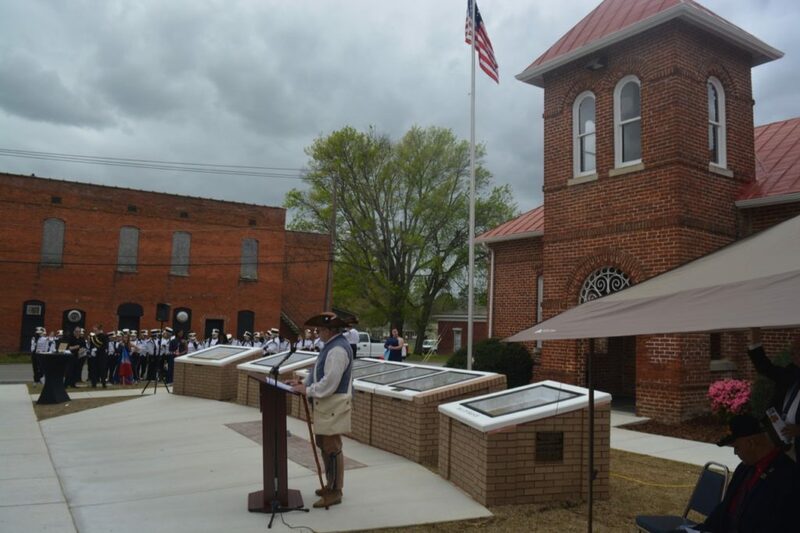 NC SAR Chapters represented at the ceremony were: Alamance Battleground, Francis Nash, General George Washington, Halifax Resolves, New Bern and Lower Cape Fear. VASSAR 1st VP Mr. Bill Schwetke also participated.